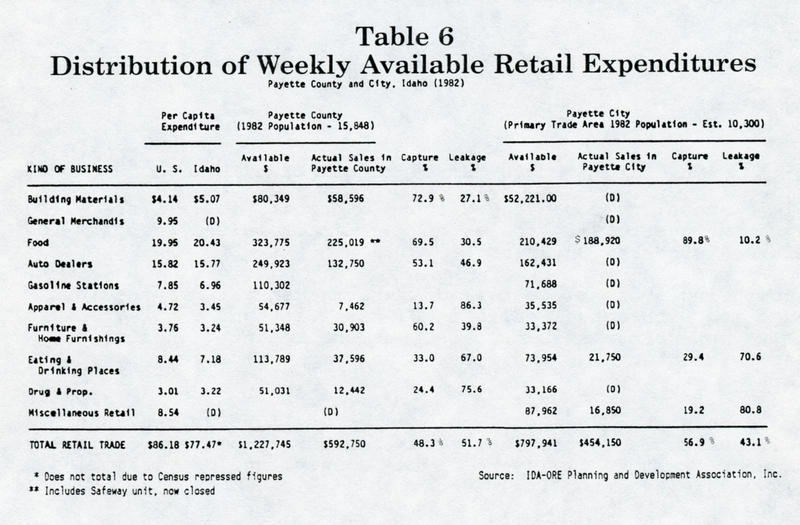 Table 6 shows the broad based trend of retail dollars traveling away from Payette City to larger and more complete shopping facilities in nearby Ontario. By comparing available retail dollars in general merchandise categories with actual sales in Payette City and County, we are able to make broad assumptions about the amount of business being lost to Ontario and other more competitive shopping districts. The “Capture” and “Leakage” columns show slightly less than 1/2 of all available (potential) retail dollars from Payette County residents are actually spent in the County, and only 37% find their way to Payette City merchants. We also calculated the total retail potential in the Primary Trade Area of the City of Payette and discovered that 57% of this potential is spent in the Central Business District and close-in peripheral businesses. The balance of all retail purchases, a very large share, is made in other retail centers, outside Payette City. Local studies (e.g. “Why Cross the River” – DECA, Payette High School – 1983) and field observations indicate that Ontario, Oregon gets most of this leakage. 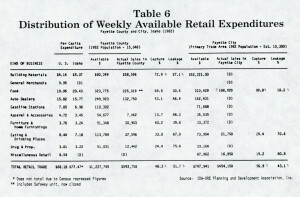 It is important to note that in 1982 Payette businesses that were modern and fully competitive managed to retain a much higher share of available dollars – e.g., 58.4% of all food sales in the county and 90% of all food sales in the Primary Trade Area. We note that Smith’s four-year old Payette store is modern, attractive and fully competitively merchandised. In the absence of Safeway (closed Spring, 1985), Smith’s is currently averaging roughly $150,000 – $160,000 per week, or almost half of available sales in Payette County and 76% of the Primary Trade Area. Although Table 6 presents a somewhat gloomy picture of current market conditions in Payette, future potential could be much brighter, given attractive, competitive facilities. Given comparable facilities, a great many residents of Payette and the nearby surrounding rural areas will choose to shop the Payette Central Business District rather than make the longer drive to Ontario, at least for convenience items (food, drugs / sundries, etc.). We do not believe that the four cents on the dollar tax incentive is an immutable rationale for driving the six extra miles to Ontario for day-to-day convenience items.